What is the best time to cruise Alaska to see whales? Luckily this coincides with the best time of year to take an Alaskan cruise. From May through September there are many opportunities to see whales from the deck of an Alaskan cruise ship. For those wanting to get closer and be guaranteed to see whales, there are whale watching cruises departing Juneau that will fill your every wish. When is the Best Time for Whale Watching in Alaska? Whales begin their migration from the warm waters of Mexico in February arriving in Alaska waters in April. 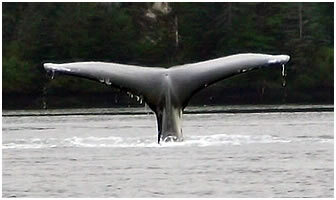 Various species of whales can be seen throughout Alaska during the months of May through September. It is not uncommon for cruise passengers to see whales right from the deck of the ship. However, you will increase your chances off seeing whales by taking a whale watching tour. The smaller boats allow you to get a closer view of the whales and you will most likely receive interesting facts about the local whale pods from your guide. Best time for Viewing Whales in Alaska. Best Time To See Gray Whales: Your best chance to see the Gray whales would be in Ketchikan, Sitka, Kodiak or Seward during the months of April and May. They can be spotted as they move to the far north Alaska waters of the Bering Sea by late April. Best Time To See Beluga Whales: Beluga whales can be seen along Cook Inlet heading south from Anchorage along what is known as Turnagain Arm in the spring through fall months. They can be viewed year round in in the southern Alaska waters of the Shelikof Strait between Katmai National Park on the Alaska Peninsula and Kodiak Island. There are no known (known to us) dedicated whale watching tour boats operating in the Cook Inlet. Best Time To See Humpback Whales: During the summer months you will see Humpback whales in the Barren Islands between Homer and Kodiak. June and July are the best months for seeing these enormous whales feeding using bubble-netting. Over 500 humpback whales make Southeast Alaska's Inside Passage their home during the months of summer in the land of the midnight sun. Best Time To See Blue Whales: Blue whales can best be seen in the northern and eastern portion of the Gulf of Alaska in July and August. They are more likely seen in open water and rarely near the shoreline. Best Time To See Killer Whales: The best time to see Alaska's resident Orca whale pods are between Early May to early June with whales being spotted during the months of June through September. They can be seen near Seward Alaska in the waters of Resurrection Bay. You also have a good chance of seeing Minke whales, Pacific white-sided dolphins, Dall's Porpoises or Harbor Porpoises if you visit Alaska between June and early September. 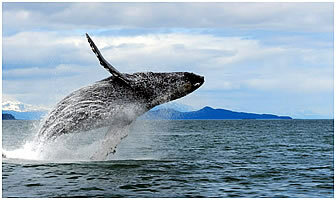 We hope that you found this page helpful in determining the best time to see whales in Alaska. If there is a question that you are unsure of, please contact us and we will try to clarify the timing and viewing possibilities further for you. See the whales of the Inside Passage during your Alaska Cruises in 2017!